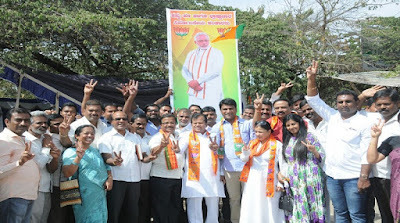 Party organizational ceremonies were held at the BJP state office in Hyderabad.Party state president Laxman unveiled party flag on this occasion.MLAs Kisan Reddy, NVS S Prabhakar, MLC Ranchandar Rao, other leaders and women leaders participated.Kishan Reddy said the party was 38 years old.There were many fluctuations in these 38 years.He said that for BJP workers, the party is available to every common man.The BJP has a great splendor for many parties,It only works for the people.He said that other parties on the party are looking at negative popularity .Karnataka will come to power on May 12 elections.He said that many schemes are to see come to power in Karnataka. opposite parties do machinations, but can not prevent BJP?The BJP will come to power in the 2019 elections. BJP state president Laxman said greet the leaders of party workers. It is the world's greatest history .. People across the country have received praise from the BJP. We have set up a doctrine of ours, the party that continues to be well ahead of BJP. Only two MPs have come to power at the Center with the highest MPs and the Modi leadership is a great thing. We have come to power in 21 states. These four years have created history in the country. Laxman said the people rejected the Congress family rule. The Modi regime has a corrupt regime. Modi's corrupt slogan said he was able to come to power in the Center.